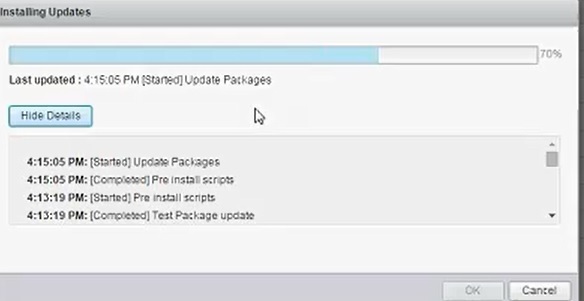 When we are installing the vCenter update using the web-client ( https://VCFQDN:5480 ) it got stuck at 70%. We waited around 10 – 15 mins but nothing happened and finally rebooted the VC appliance and once it came up found that it got updated in the back end. Later noticed it is mentioned in the Release-notes but when we try the same update using CLI in another VCSA it went successfully without any issue. This entry was posted in vCSA 6.0 and tagged VC6.0 Installation Issue, VC6.0 Update 1b, vCSA 6.0. Bookmark the permalink.